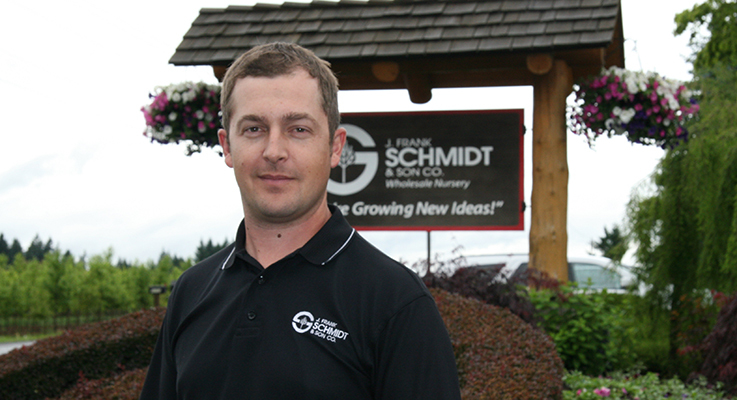 For over 70 years, J. Frank Schmidt & Son Co. has been “Growing New Ideas.” True to its tagline, the Boring, Oregon-based wholesale grower introduced the now-legendary landscaping staple Red Sunset® Maple to the world, as well as more than 50 other patented or trademarked cultivars. Today, in addition to growing more than 500 varieties of shade, flowering and specialty ornamental trees, the company is also nurturing its successors. Cousins Sam Barkley and Gordy Webster are being primed to become the third generation to oversee the family-owned company, which is currently headed by their uncle, J. Frank Schmidt III, and Sam’s mother, Jan Schmidt Barkley. Over the past decade, Sam and Gordy have worked their way across the operation, logging time in numerous farm fields and mastering all other aspects of the business. Chad Webster, Gordy’s brother, is going through the same training program for a future leadership position within the company. Additionally, Sam has taken on a leadership role with the Oregon Association of Nurseries, serving as president of the organization’s Mt. Hood Chapter. This summer, the chapter hosted two get-togethers of young nursery professionals. This year’s Farwest Show will also host a gathering of up-and-comers so they can network with their peers. The Emergent Networking Event will take place at 3:30 p.m. Wednesday, August 23. It will provide a forum where 30-somethings and younger can meet with their peers and share their vision for the future of the nursery industry. I went to Oregon State and got my degree in international business. But I always knew, ever since I was young, that I wanted to work in the nursery. When did you start working for the company? When I got out of college, I went and worked for a couple of our customers in Ohio — Sunleaf Nursery and Herman Loseley. I worked out there for about a half-year, on the crews, learning everything. We send a lot of the liners they grow, so it was like starting on the receiving end. I unloaded all of our trucks with our trees out there and helped plant them. I learned how to grow trees from our customers’ perspective and learned what it is they’re looking for. It was a great experience. After I came back, I started working at our Barlow Sunset farm in Canby. Then I started working in our Research and Development department. I’m currently at our seedling farm in Boring. The goal is for Gordy and me to be well rounded in all areas of the company, in addition to our production experience. What have you enjoyed learning about most? Research and Development was probably my favorite area. Our company is renowned for our R&D and our new tree introductions, so I took a lot of pride working there to produce as much as we can so we have more to pick from. I just loved dealing with all the different plants. We’d get seeds, bud wood and grafting wood sent in from all over the country and the world to trial new plants. You never really know what they’re going to turn out like. So every spring when stuff starts growing, it’s like Christmas every day, looking out at the trees and seeing what they’re going to do. It takes 9–15 years from the time you grow a seedling to actually being introduced. That’s a big investment. Labor. Our workforce is aging, in their 50s and 60s. A lot of these people have been with the company for 10 to 20 years. There aren’t very many able-bodied younger people knocking on the door looking for a job. To deal with the labor shortage, the past few years we’ve done labor sharing. Today, for instance, I sent as many people as I could afford from the seedling farm to help out at the main farm, where there was a lot to get done. We’re working within our company to fill in as needed. We’d like to increase our inventory, but we’re not about to put our quality on the line. The perfect tree — that’s what we stand behind. We’ll grow only as many as we can produce that in our eyes will be the complete package. What is it like to work for a family business? It’s fun, but it’s not always easy. People think being in the family and working in the business is easy, but it’s really twice as hard because everybody is looking at you. So you have to really be on your A game. This is my future, my plan for as long as I work, so I have to try and make it the best I possibly can. Where did your work ethic come from? My mom and my dad, which trickled down from my grandparents. Respect is earned by working hard to be the best you can be. I’m the first one who comes through the gate in the morning and the last one to close it, always with a smile on my face. It’s kind of a relaxing feeling, I guess, to think how the day went, and tomorrow will be another day. I don’t really have any bad days where I think, “Oh, I hate my job.” If I did, I probably wouldn’t be here. What do you love about working in the nursery industry? I’m a busybody. I have to be moving and be outside. I enjoy the different seasons, new challenges, not doing the same thing over and over. As soon as you get done with one thing, something else starts up, and it’s constantly changing, which keeps it interesting. There are always challenges that you have to figure out how to overcome them. It’s what keeps you moving. I come to work with a plan, but I know it’s going to be thrown out as soon as the day starts. You gotta have a plan but be able to adapt and conquer. What purpose do you think the gatherings of young nursery professionals serve? There just aren’t that many owner-operators anymore. Lots of companies don’t have successors, so we’re trying to reach out and get others involved, help each other out with new ideas. Half of the attendees are from family-owned businesses and the other half are looking to get started in the industry. I took a few of our management trainees from a new program we have going on here. I also took our interns, who come from Italy, Brazil and India. It’s good for them to get out and meet people. The young grower events help us start building working relationships with each other. We’re in the same industry. We can’t work against each other. We have to help each other out. We want to develop a nice community of young nursery professionals where we all know each other, because we’re going to be the future one day soon. Come back and ask me in 20 years.